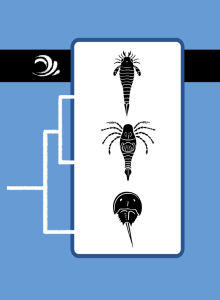 The extinct arthropods of the water are chelicerates: a eurypterid, Hughmilleria; a Stylonurid eurypterid; and an early horseshoe crab, Lunataspis. Eurypterids walked on legs and swam with paddles. They also had chelicerae (“claw horns”), which were claws by their mouths that helped them catch and eat prey. This adaptation helped them dominate the seas. Some, such as Hughmilleria, adapted to habitats with brackish or fresh water. Others, such as most of the Stylonurids, lost their swimming legs and only crawled. Like Eurypterids, horseshoe crabs are descended from the original chelicerate ancestors, along with scorpions, spiders, and other arachnids. These arthropods all arose during the Paleozoic Era, which ended in a great extinction event 252 Mya. Many sorts of arthropods survived, but not the eurypterids.